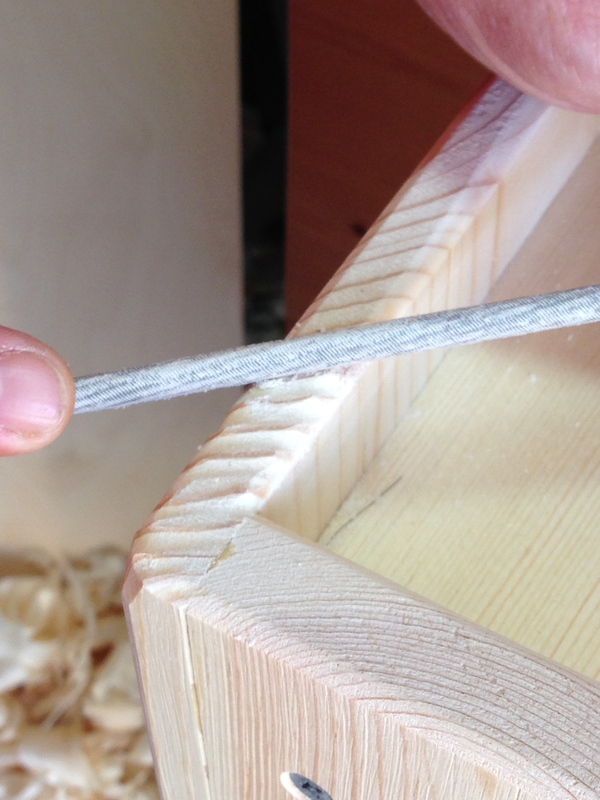 When I first learned of these tools and saw the resultant finish, I knew it was a technique that I wanted to explore. So to that end I began experimenting with materials that I had on hand to try to replicate the function of the actual uzukuri. I also tried to source the actual materials from which to manufacture my own. In the end I made my own version using broomcorn from a cheap broom. Which worked as an acceptable substitute for the “rough” version of the proper tool. To simulate the “medium’ and “fine” versions I employed varying grades of synthetic scuffing/buffing pads. Those pads can be rolled, wadded and folded as needed. With those substitute tools in hand I began to experiment further to discover the possibilities of this technique. I quickly learned that I was quite fond of the surface that was possible. I also immediately knew that it was something that I would be employing quite a bit in my future work. I don’t buy a lot of tools. However, I will spend the money if the tool is something that I know I’ll use quite a bit or I can’t reasonable make on my own. So I splurged and bought the three proper uzukuri. That being said. If you think you may only use this technique once in a blue moon or just wanting to experiment, then the previously mentioned broomcorn version and buffing pads will serve you quite well. All of the things I discussed in Part 1 continue to hold true and are working very well. There are a couple of areas that have given me difficulty though. One area is that which has a wide expanse of early (soft) wood. In those areas the “rough” uzukuri tends to leave deep grooves. Most, not all, of which can be removed with the “medium” uzukuri but it takes quite a lot of work. I needed a better way. First I experimented with sandpaper for this. Sandpaper works, but is hard to control given the relatively small area that I’m working in. Next I tried using a gouge. That actually worked well, but resulted in an uneven surface within the softwood which took just as much effort to correct as the original deep grooves. My day job has me on the manufacturing floor just about every day. The primary operation taking place is welding. We work with both steel and aluminum for the products that we produce. It’s the aluminum welding operation that gave me the answer for removing the grooves from the large areas of soft wood. The last operation when creating an aluminum weld is to clean it with a stiff wire brush. These brushes come in several sizes. The most popular size on the shop floor is about the size of a toothbrush. These come in both brass and stainless steel. This brush looked like it might work. I picked up a couple of stainless steel brushes from the welding supply aisle at the Home Depot and toted them back to the shop. Sure enough the brush worked like a charm. Abrasive enough to speed up the removal of wood, yet fine enough to leave a relatively smooth surface. I find the brush to be very controllable and it also conforms well to established grain pattern raised by the “rough” uzukuri. That problem is solved. The other area of difficulty is end grain. None of the three uzukuri are very effective on end grain. For the most part this is not that big a deal. Generally the projects that I build have very little exposed end grain. 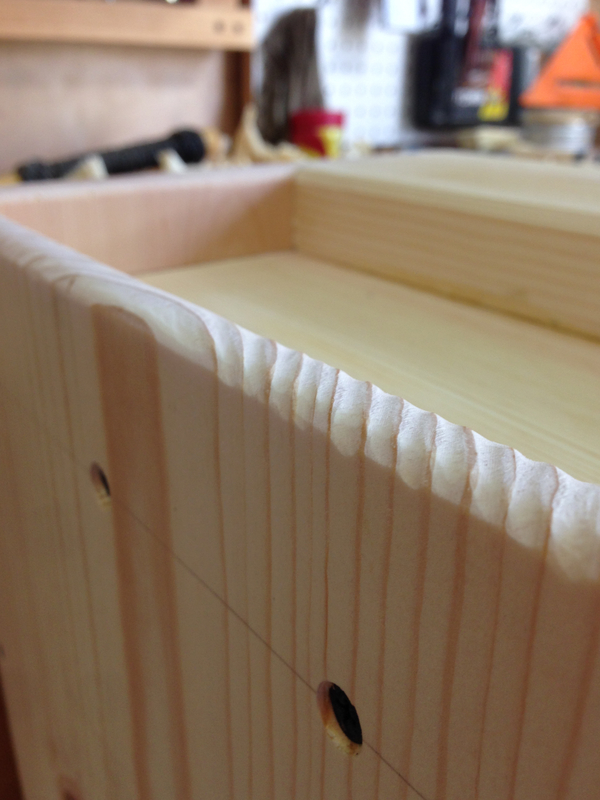 But I still wanted to find a solution to extending the surface treatment to the end grain. The wire brush works quite well on fine grain examples. For the more open grain pieces, I found the best solution to be a small round file. A couple of light strokes with the file, in the soft wood only, is all that is needed. 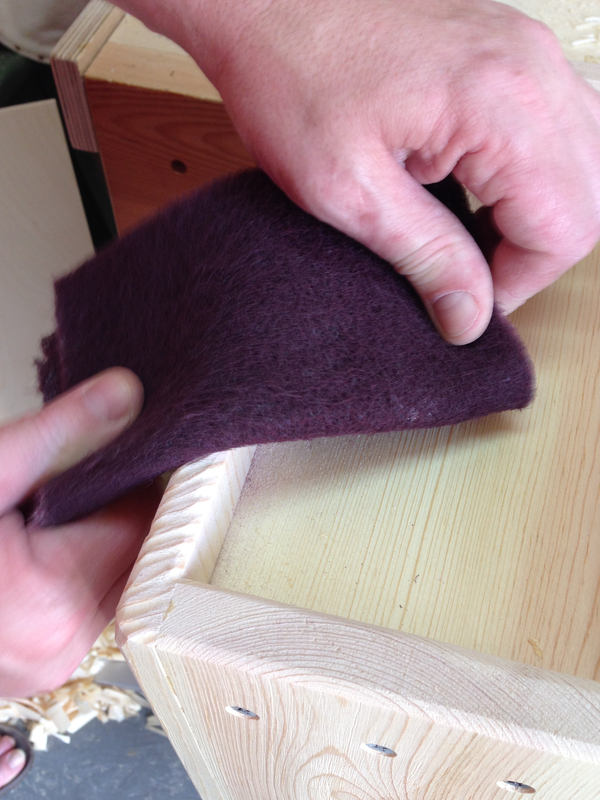 The final touch for the end grain is a light rub with a buffing pad. Another trick, I learned strictly by happenstance. It’s been abnormally hot the last few days. 90F hot. So while working on one of the sides some sweat dripped onto the work piece. The wetted area reacted very differently than the dry area. The wet area caused the uzukuri to be far more aggressive in the soft early wood. So a little experimenting and I discovered that by wetting the wood I could remove the early wood to a greater depth without any significant change to the harder late wood. 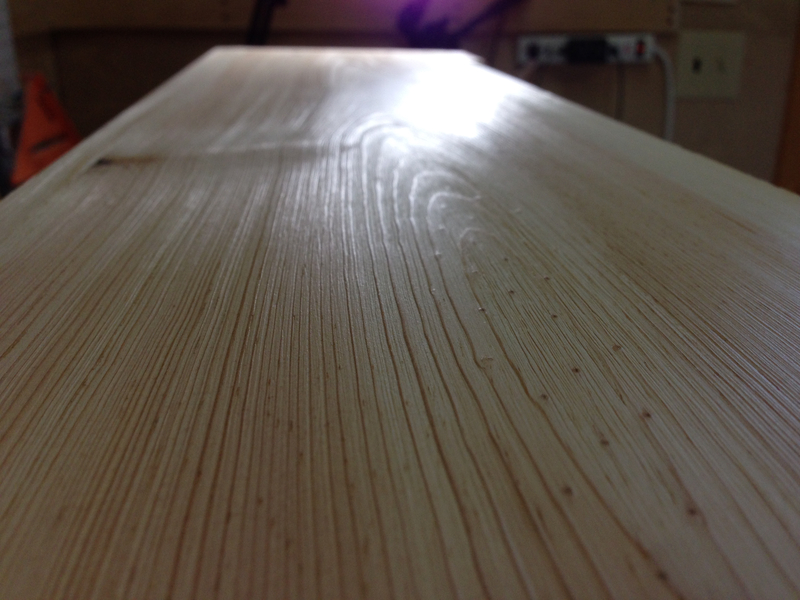 The result is a much more defined grain pattern. The downside is that I’ll need to let the wetted areas dry for a day or so before continuing with the “medium” and “fine” uzukuri. You can’t burnish wet wood. The photo below shows the result of wetting and the “rough” uzukuri. 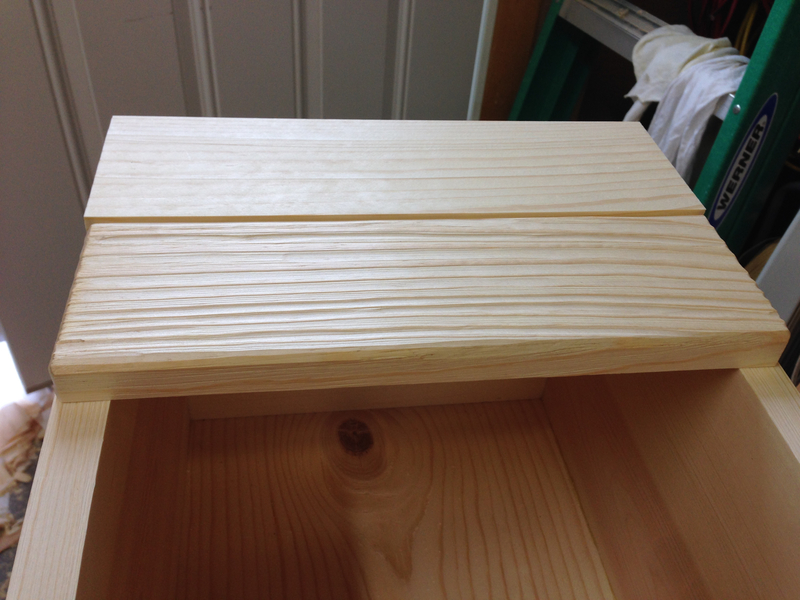 A couple of photos looking down the sides of the Japanese toolbox that I’m building. 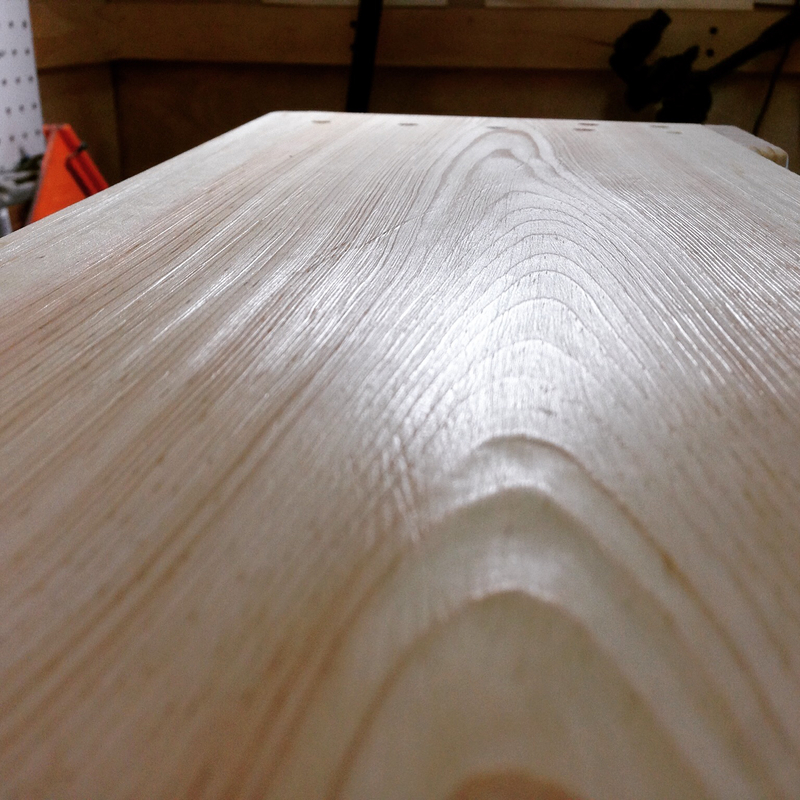 I also experimented with a deeper pattern applied to a piece with somewhat open grain. After first using the “rough’ uzukuri, I used the gouge to deepen the groove in the soft wood areas. One long, very shallow cut with the gouge was all that was needed. I then followed up with the “medium” and “fine” uzukuri. Much more dramatic in both appearance and texture. In the next part I’ll discuss how this technique responds to oil finishes. This entry was posted in Finishing and tagged finishing, uzukuri. Bookmark the permalink. Is this more or less the same technique that some Asian woodworkers do with slightly scorched wood? Yes, very similar in that the soft early wood is abraded away to reveal the grain pattern. They call it a “wheel sander, ” but it has a set of wire and nylon brushes, some impregnated with abrasive, which behave essentially as a power-uzukuri. We found it effective but surprisingly slow going, which makes me wonder if the traditional tools would be just as efficient, though they would certainly be harder on the elbows. I’m not advocating for the power tool, but it’s interesting that the demand for this texture effect in Japan justifies its manufacture. Incidentally the fibers on the coarse uzukuri look just like the bristles found on inexpensive dish scrubbing brushes which I used to buy at Japanese dollar stores in L.A., and which take almost the same form, although not as densely packed. I’ll have to see if I can find one at an Asian grocery to try out. Ha! I knew there was an electric animal for this. Through my research and fuzzy Google translations of Japanese, I knew that this technique is a very popular option for wooden floors and that it was done with an electric tool. Thanks for the link! The large panels on my toolbox are about 9″x28″ and it only took me about 15 minutes per panel to create the surface in the photos. I don’t think that is too bad. I wouldn’t want to do an entire floor by hand though. I live near the Atlantic Ocean and find driftwood that was once milled lumber and it has the same effect on the grain. Waiting for the wind and the tides to rinse the grooves out is sure slow! That’s an option I guess. You build something and then chuck it in the ocean with a note. A year or so later someone could find it and ship it back to you. 😉 But, this way is a little easier. Sorry about that David. Yes, I’m happy that I purchased all three. Since I anticipate using this technique quite a bit, the three proper tools will add speed and predictability. The alternatives will work just fine for those who will only be doing the odd project now and again. This was an extravagant purchase for me. Which speaks to how much I like the finish. I’ll give the video thing a go when I apply the finish to the toolbox lid. No promises though. I struggle with making videos. I meant to ask this before because I know you are a fan of “Eastern” woodworking, but what woods do the woodworkers in Japan use most often? I’ve noticed that oak is sometimes used (considering oak trees are among the worlds most common that does not surprise me), but I also notice that they use a lot of soft woods. At that, I could never really figure out which soft woods that were preferred. Sorry to bother you, I just thought you may know. 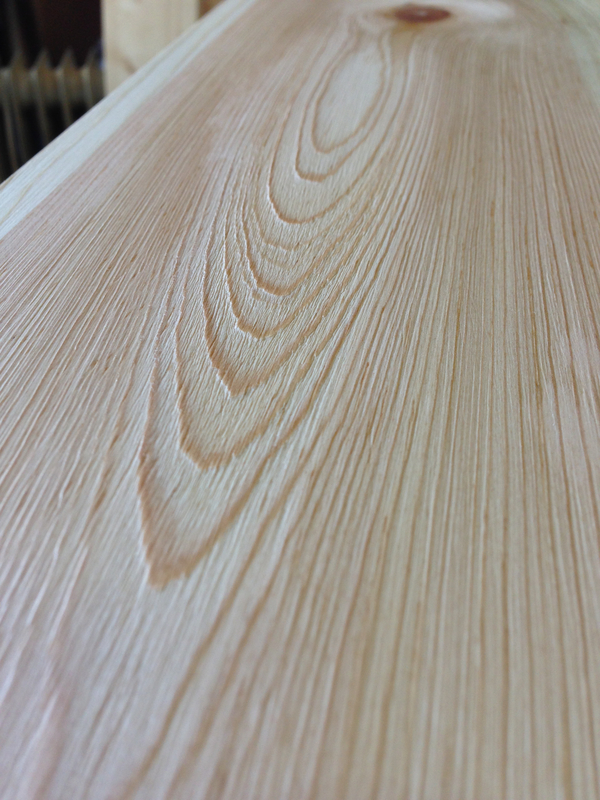 Paulownia, pine, cedar, cypress, chestnut and elm seem to be the woods that predominantly used for tansu and other furniture, based upon my research. The following website sells Asian antiques and generally lists the wood that the piece is constructed from.